An Officer (retired) and a Librarian . . .
Here’s a great graphic that I discovered this week (thank you Stephen Abram and Lone Wolf) that outlines the various levels of intamacy in communication. Hmm, we really do spend a lot of time communicating each day. This graphic even showed up in a Web 2.0 seminar that I attended Friday . . . enjoy! A couple of weeks ago I read about an artist in the Chicago area who leaves his original works of art in public places . . . he then tweets and sends text messages providing clues as to the location of the art . . . and whoever gets to the art first, is free to take it. A bona fide art scavenger hunt, or “Human Race” for the art. What a cool concept. This makes me wish I was living in Chicago. And, while this could slow down my art purchasing, there’s no guarantee that I would be the first to happen upon such art . . . ah, but for the possibility! After visiting the artist’s webpage I discovered that he plans to take his show on the road across the country . . . hmm, perhaps he will stop in Tulsa! Here’s the full story. Here’s Patrick Skoff’s webpage. It’s Winter and the days have been dreary, but yesterday a colleague of mine walked into the room and presented me with this early glimpse of Spring (Thank You Linda!)! These Narcissus not only brightened my day, but they now brighten my office (for many days to come . . . and if I can figure out how to keep them alive, for many years to come) as I patiently await the true arrival of Spring. The weaterman predicted some possible snow today . . . I’m really hoping he is wrong this time . . . we’ve had a most bizarre Winter this year and I’m definitely ready for Spring. Happy Friday! Visions of my grandmother “churning” away led me to believe that making butter was a complicated and arduous process. A belief that couldn’t be further from the truth. However, it does require a bit more effort than merely grabbing a pound off of the grocery store shelves. Butter comes from cream, so if you whip the cream long enough you will eventually end up with butter. 1. Pour your heavy cream into a chilled mixing bowl. Whisk at medium speed (food mixer) until thick. It will progress from the softly whipped stage to the stiffly whipped. Keep whisking until the whipped cream collapses and separates into the butterfat and the buttermilk. 2. Transfer to a clean cheesecloth or sieve and drain well. You can save the buttermilk for other uses. Re-beat the butter for another 30 seconds to 1 minute to expel more buttermilk and drain as before. 3. Fill the bowl containing the butter with very cold water. Use butter bats (or clean hands) to knead the butter to force out as much of the buttermilk as possible (any remaining buttermilk will sour and make the butter go bad). Keep your hands cool . . . if you handle too much with warm hands, the butter will liquefy. 4. Drain the water, cover and wash a couple more times, until the water is clear. 5. Form into slabs (using butter bats that have been soaked in ice-cold water for at least 30-minutes — to prevent sticking). Wrap in waxed paper and keep chilled in the refrigerator. The butter also freezes well. Voila! You can even “flavor” your butter (herbs, generally, but also some alcohols), if so desired. Here are a couple of great vocabulary words . . . they are somewhat similar in meaning. Could “expatiation” be considered the “loggorhea” of writing? Hmm, I would certainly tend to think so. 1. To speak or write at length or in considerable detail. 2. To move about freely; to wander. 1. pathologically incoherent, repetitious speech. 2. incessant or compulsive talkativeness; wearisome volubility. Hi Ho, Hi Ho . . . !
. . . it’s off to work I go! And speaking of work, I ran across this wonderfully humorous quotation and I just had to share. Then, I got the great idea to check my Cynic’s Dictionary to see how the cynics define work. And, while I was at it, why not add a demotivational poster from www.despair.com . . . enjoy! What started out as a great basketball season has slowly begun to unravel within the last couple of weeks as the Michigan State Spartans have squandered a three-game lead in the Big Ten Conference to find themselves tied for second place. And, the Spartans travel to Purdue on Tuesday for a showdown with the league leading Boilermakers. As March approaches, the “madness” intensifies. This late season funk certainly does not bode well for the Spartans as they gear up for the NCAA Tournament, but once the tournament starts, rankings and seedings don’t always matter. Hang on, it could get wild! Go Green! In addition to the Spartans (#11) losing to Ohio State (#12), the other weekend upsets included: Baylor (#22) losing to Oklahoma State (NR), Wake Forest (#25) losing to North Carolina State, and Villanova (#3) losing to Pittsburgh (#21). Guilty as charged . . . wow, I really need to start getting more (and better) sleep! Case in point: here it is Monday already and I hardly feel rested and relaxed from the weekend. Perhaps this is partly because it was my turn to work the weekend shifts. 1. You’re flummoxed by even simple decisions. 2. You’ve been eating all day and you’re still hungry. 3. You keep coming down with colds. 4. You’re an emotional wreck. 5. You’ve become a klutz. With a hint of orange (or course). Here is another piece of glass that I picked up in a gallery last summer when I was in Michigan on vacation. 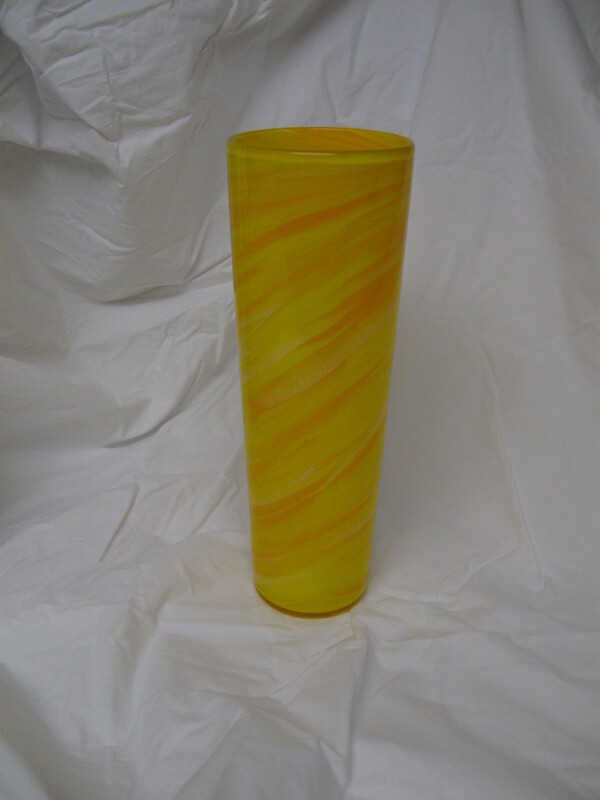 At first glance, this piece looks fairly unremarkable — a simple vase, nothing fancy. However, when considering the pieces I have already collected, this one compliments my existing collection by adding a dimension that was missing/lacking. Whether it is the color (one, two, multiple, swirled, etc. ), the size/dimensions (big, small, flat, tall, etc. ), or the shape (straight, wavy, fluted, etc. ), no two pieces are exactly alike and they create a panoply of color on my countertop. 2. a complete suit of armor. 4. full ceremonial attire or paraphernalia; special dress and equipment. Here’s a video that was submitted in a contest by a 20-year old. The contest was titled “u @ 50” by AARP. This video won second place. When they showed it, everyone in the room was awe-struck and broke into spontaneous applause. So simple and yet so brilliant. This is very palindrome-like. And while it is not a palindrome in the strictest sense, it is pretty amazing nonetheless. Some food for thought for a Saturday! The Rain: a Song of Peace! Fun Fact Friday, Number One Hundred Twenty-Three! Spring Cleaning, Are You Ready? !